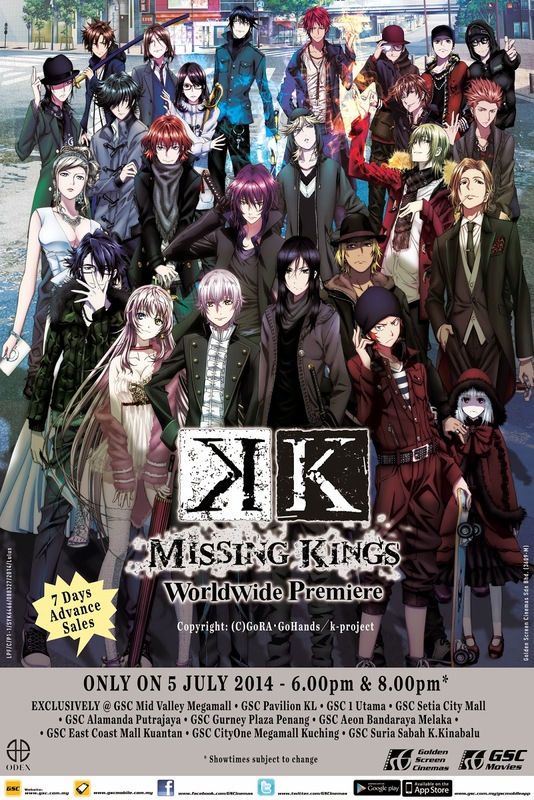 5th July 2014, Petaling Jaya - “K MISSING KINGS”, the brand new movie feature and sequel of the very popular “K” anime series had a one-day World Premiere on 5 July 2014. Malaysia was one of five countries participating in the World Premiere, the others being USA, France, Taiwan and Singapore. For every tickets purchased either at cinema ticketing counter, online ticketing or mobile app at GSC e-Payment, customers will be given a free “K MISSING KINGS” memo pad and tissue pack (on first-come, first-served basis). Redemption can be made over the counter with proof of purchase. Shingo Suzuki will be returning as Director and Character Designer. • The USA and France world premieres will be held on 5 July 2014 at the Anime Expo (Los Angeles) and Japan Expo (Paris). • A new character named Yukari Mishakuji will be by voice actor Masakazu Morita. • The theme song "Different Colors” will be performed by the band angela. The CD single will go on sale on 12 July 2014, the same day as the film's theatrical opening in Japan. The CD will also include a new self-produced rendition of Mikako Komatsu's second single "Tsumetai heya, Hitori" (Alone in a Cold Room), the ending theme of the K television anime. • For further information, log on to www.gsc.com.my and www.gscmovies.com.my. “K MISSING KINGS” is distributed in Malaysia by GSC Movies Sdn Bhd.